Serving the San Diego County since 1995 We guarantee the best value and the most professional service in San Diego county. White Doves have always been a symbol of eternal love and peace. A release of our LoveDoves will add a special enchantment to your wedding day and can be arranged for either church or outdoor weddings. A unique and memorable way to start your new life together! What a Grand Finale! Our professionally trained bird handlers will help you coordinate the most effective release. 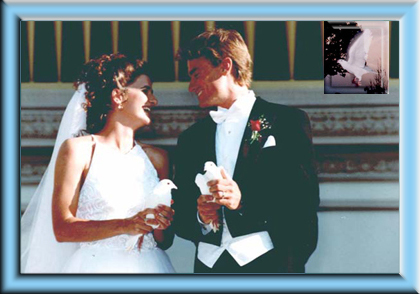 We will meet with you before your wedding day to practice holding the doves and evaluate the release site. The exact placement of the doves and knowing how they will react (fly) is very important. We also assist in coordinating the release of our LoveDoves with your photographer/videographer allowing you to capture this memorable moment and savor the memories forever. Please take a moment to view our LoveDoves Memories pages. After the ceremony, your guests will gather outside the church. The Bride and groom will exit the church and walk through the aisle that the wedding party has formed. You will each be handed a dove to hold while a family member or member of the wedding party reads: "Symbol of the Dove". After the reading, the bride and groom will release the two doves and a mass release of doves will follow. The usual procedure is to perform a two dove release during the ceremony, for example, after the exchange of rings. The bride and groom will each be handed a dove while the minister reads: "Symbol of the Dove". Then a mass release of doves will be your grand finale as you both are introduced as "Mr. and Mrs." for the very first time! "White doves are symbolic of purity and love. The doves released here today, represent the love and commitment you have given to one another. From this day forward, whenever you see a white dove, you will be reminded of this moment, and of the vows you have exchanged." Please Email us for more information. Thank you.